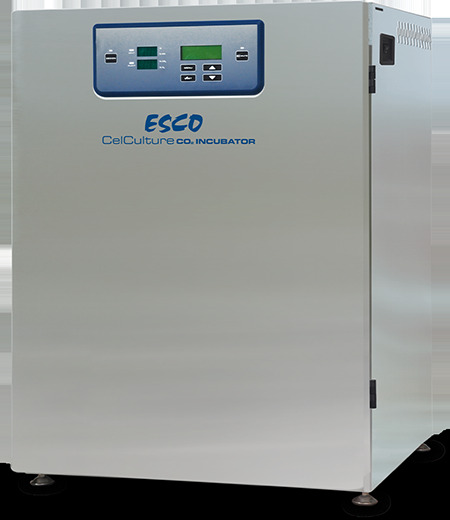 Esco is continuously working to delight its customers by offering new models of CO₂ incubator. To better cater to the demands of CO₂ incubator users, Esco is proud to introduce the NEW CelCulture® CO₂ Incubator with Stainless Steel Exterior Cabinet. SteriSafe™ ULPA filtration enables the chamber air to be maintained at ISO class 5 condition. SwiftCon™ 90˚C validated moist heat decontamination cycle operates overnight to eradicate any contamination in the unlikely event it occurs. At the end of the cycle, the chamber is dry and ready to use.Note: For CCL-50L units, further wipe down of the chamber is needed since it has no decon pump and condensation will normally occur after the decontamination cycle. All input gases are filtered by in-line filters before they enter the chamber to remove impurities and contaminants. The interior of the chamber is made from stainless steel type 304. Comprehensive user-configurable alarms for all the parameters. CelAlert™ alarm system reminds user to replace CO₂ tank and ULPA filter. Intelligent data and event logger records all incubator parameters for on screen recall. 2 MB built-in flash memory guarantees long term storage of data. Diagnostic interface and on line quick help provide comprehensive solutions to frequently. encountered problems. Chamber is made of shiny stainless steel chamber with all rounded corners. Ductwork, plenums and shelves are removable without tools. Glass door is removable without tools. Inner gasket removable without tools. Diagnostic functions in the microprocessor include historical read-out of the parameters.